It’s taken me a little while to post about our trip because as soon as we got home we got a call that Grady’s uncle died and we headed back out the door to go to Birmingham for the funeral. I’m just not getting back into the swing of things here. I’m going to do a few posts on our trip because it was a really good one and I want to make sure to cover it properly. We’re very thankful to the Lord for giving us such a sweet and fun time away together! We had BEAUTIFUL weather AND leaves – we were definitely there at peak time. Once we arrived on Saturday we checked into our hotel and got to know the lay of the land and had a great dinner together. We got up early Sunday morning and had our quiet time with the Lord and then headed to the Biltmore house for our first tour. WOW is all I have to say! We enjoyed the tour and history of the house more than we thought we would. It’s quite fascinating and if you get a chance to go (or haven’t been back for years) I highly suggest you make a trip out there. They have more of the house open than they ever have – and the audio “tour” (headphone you listen to) is a MUST – you would miss way to much without it. After lunch I was itching to paint. Grady hopped on a bike and toured the 8,000 acres (obviously he didn’t ride the scope of the entire property!) while I found a secluded spot to paint. 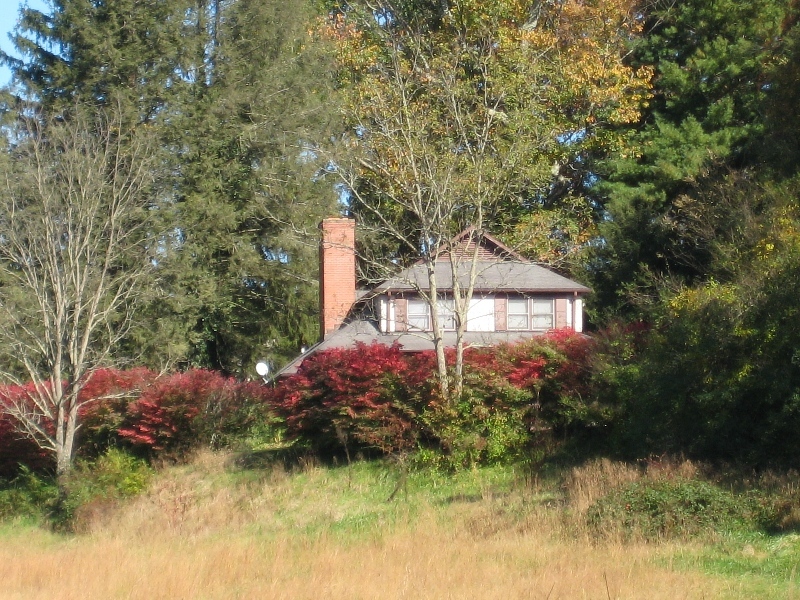 I found this great little house peeping behind some flaming red burning bushes. It was a fun little house to paint and I really enjoyed my afternoon. I did some different things in the journals I took on the trip. Before we left I pre-pasted and taped different things in my journals. You’ll see some of these “different things” through my journal pages as I post about this trip – some of them are “interactive” – you’ll see what I mean in later posts. On this journal spread you can see I used some vintage paper out of an old accounting book I found at an antique shop. 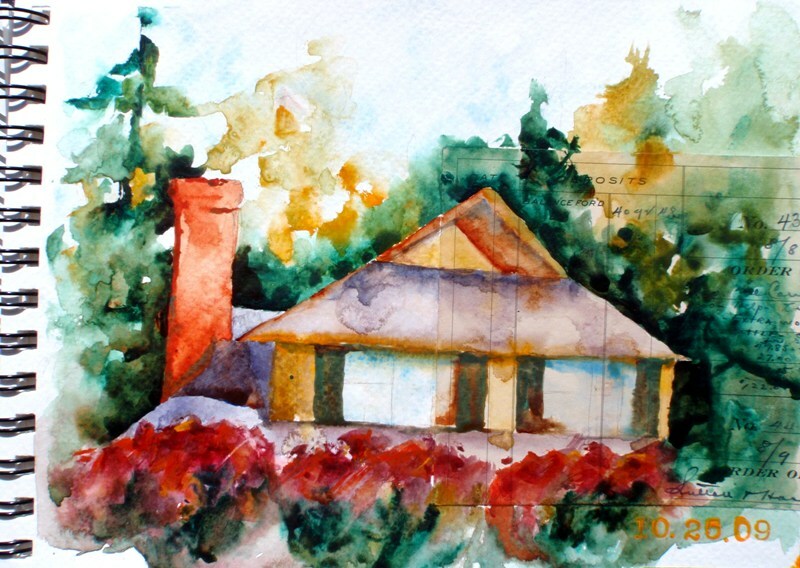 I pasted part of the accounting paper on each journal page and wrapped it around the back of the page (can you see it on the house painting – it’s barely noticeable but I think it still adds some neat depth and texture to the painting – you can see a close-up below – just click on it to see it larger). Well, that’s all for the first post about our trip – more to come soon! This is beautiful, Sandi. I so admire all of you talented artists, especially when you keep journals or sketchbooks to order your thoughts and works like this. Can’t wait to hear the second installment. I am also sorry for the loss of your family member. My thoughts and prayers go out to you and your family. Thank you for your kind comments and prayers for our family! I hope to have the next installment coming soon! Jeff and I just got back from Asheville for our 3rd anniversary! 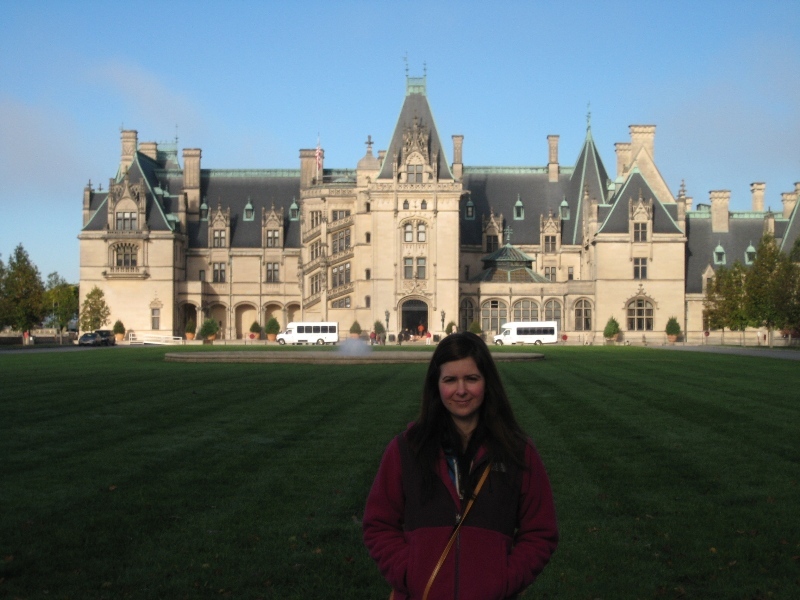 Its really a magical place 🙂 And the Biltmore was amazing, I agree… Its fun to see your take on the area- can’t wait to see more paintings! Rachel, I was looking at yalls blog just the other day and saw that on there! Yes, it is a fun place! In fact, I hated I didn’t know about that artist community when I was there – I’ll be checking that out next time we go. Thanks for stopping by!